17 January 2019: The leading multi-brand Retail Electronc Chain- Value Plus Retail Private Limited is always in a continuous endeavour to give nothing but the best to its customers. Very recently Value Plus announced the launch of Buy and Win which is a yearly lucky draw scheme which gives a chance to all its customers to win 2 cars, 50 bikes, 100 LED Televisions, 200 Mobile phones and 1000 Home Theatres. Every customer receives a lucky draw coupon on the purchase of Rs.10,000 and above from Value Plus stores. The coupon is then picked at an annual lucky draw event where winners are announced. The scheme started on 1 July 2018 and went on till 31 December 2018. The lucky draw event was held on 16 January 2019 at Value Plus Mahanagar alongside 6 other Value Plus Stores across India. Many customers got a chance to win Bikes, LED Tv, Home Theatre and Mobile Phones. The draw was aired live on the Value Plus Facebook Page. The customer seemed very satisfied and spoke in volumes about the wide range of electronics available at best prices at Value Plus Stores. 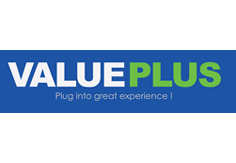 Due to its unmatched services, Value Plus has marked a niche for itself in the Electronics Market and is North Indias Leading Electronic Retail Chain. The finale for the draw will be held on 22 January in Value Plus Head Office at Noida. The winners for Bumper Prize-2 Cars will be announced at the Mega Event. Meanwhile Value Plus has also launched Buy and Win 2019 which started at all stores on 1 st January 2019 and will continue till 31 st December. The Draw for 2019 will be conducted in January 2020.